Cabela is a renowned retailer organization. It is well known recreation trade name for its services related to outdoor which includes hunting, fishing, etc. Since its inauguration in 1961 it is regarded as the world's leading outfitter. 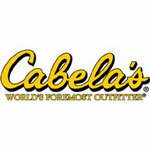 Cabela offers a wide range of high quality products and they also provide advanced customer services. Cabela's journal magazines are aimed to help the hunters. In these magazines, adventurous incidents are published to encourage the hunters. Users can get these magazines under one, two, or three year subscriptions. Cabela's Shows on television also inspires the hunters and helps them to learn many important issues regarding hunting. There are currently 5 consumer reviews about Cabela's available. Share your review. I have bought from you for years with no complaint. The shipping you charged me to get a pair of NB shoes was disturbing. Won't be buying anything for a while. Wow not even a good customer experience on this. Rep didnt like what he heard couldnt help ended chat. All over 35.00 to a high value Black Card Member. Even sent link to validate the claim. didnt even expect full credit of difference jsut something to say yeah we are way overpriced ! even store credit was requested not even a refund of difference. NOTHING GO AWAY WE DONT NEED YOUR BUSINESS is basically the answer by ending chat in the manner the rep did. Tim H.: Hi, my name is Tim H.. How may I help you? mark schmitt: Order 216139892 mark schmitt: I was checking as this powder is 28.99 but at brownells it is 21.99 is there anything Cabelas can do to make this a little closer this is nearly 30% higher mark schmitt: I am a black Cabelas Club Card member mark schmitt: 749-011-430 RELODER 22 POWDER, 1 LB 6 Tim H.: I am sorry but we only price match in our retail stores for local competitors. mark schmitt: so nothing can be done with it ? mark schmitt: not even some bump to the cab points or anything ? mark schmitt: here is the link to brownells mark schmitt: http://www.brownells.com/reloading/powder/rifle-powder/reloader-22-powder-reloder-22-powder-1-lb-sku749011430-41138-74198.aspx Tim H.: I apologize but I have no way to help here. mark schmitt: anyone at Cabelas that can this seems to be a huge price difference and Cabelas taking advantage of the powder shortage and gouging custs mark schmitt: 5-10% is one thing 30% is different. Tim H.: I just checked and this has been the price since last July. Tim H.: Is there anything else we can do for you today? mark schmitt: not unless you have a contact that can help on this mark schmitt: otherwise I will take business to Brownells it is heck of a lot cheaper Tim H.: I am sorry but no. This has been our policy for over 15 years. mark schmitt: Ok mark schmitt: you would think you would take care of BLack Card Members mark schmitt: guess status and loyalty is nothing to Cabelas Tim H.: Thank you for visiting Cabelas.com. Have a great day! mark schmitt: I will blog this out. mark schmitt: thanks, Tim H. has disconnected. Cabelas does not care about customers, only profits. I have relied on them for some time and convinced many others to, only to learn the hard way. In the current firearms market, there are much better retailers to count on who will not cancel you orders and limit you to 20 rounds of ammo at a time. Other companies might even contact you when you want to buy an expensive firearm, but Cabelas makes it clear they do not care about your business. Please take a note that you are about to post a public review about Cabela's corporate office on CorporateOffice.com. This review will be public, so please do not post any of your personal information on this website. If you would like to contact the corporate offices of Cabela's, please use their contact information such as their phone number, website, and address listed above to contact them. However, sometimes staff from Cabela's headquarters do read the reviews on this website.